Imprint Method: Silk-Screen - Make sure your branding is noticed by everyone when you sell this burlap rope tote bag at your place of business! It's made of 12 oz. 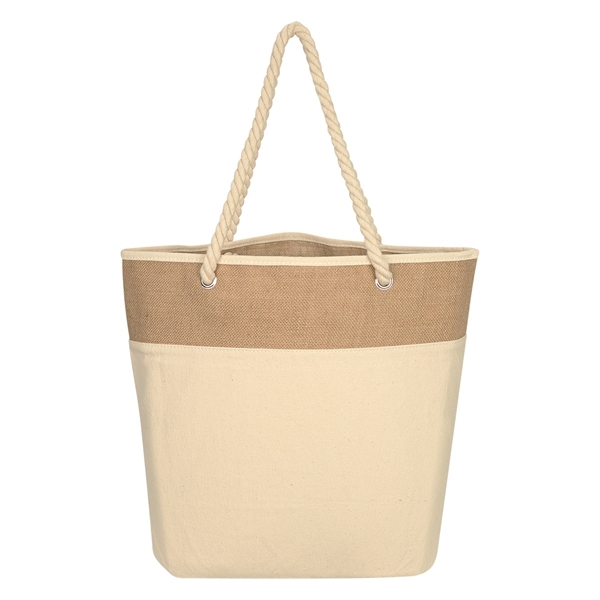 cotton canvas and features an 8" bottom gusset and 25" rope handles. This is something that will certainly catch the attention of many customers. You could even make it a giveaway at your next event. Spot clean/air dry recommended for care. Add an embroidered or silkscreened logo and let your clients do the advertising! Size: 19 " x 15 " x 8 "
Imprint Size:10" x 7", 5"